Palmerston Road is home to a variety of different shops some of the shops included are Debenhams selling a wide variety of merchandise, Stranded at Lees is a traditional Chinese Cuisine, Pilot is a clothes shop, Nibblers is a coffee shop and take away, Picketts and Pursers is a jewellers, WH Smith sells a wide variety of products including CDs, Magazines and stationary, Knight and Lee is a well established cloths shop, Acalaid is a hair salon and Boots is a chemists. 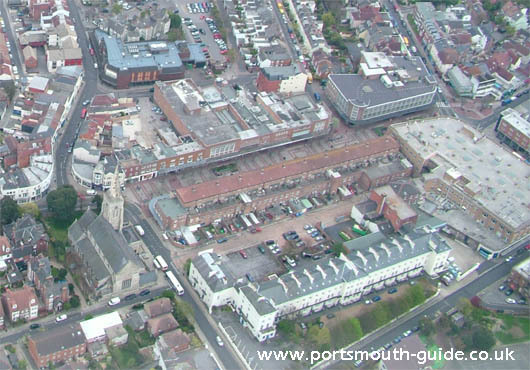 In Palmerston Road (South) there are many more shops including Sur-La-Mer a French restaurant and Fabio's is a designer labels cloths shop. In Marmion Road there are yet more shops including Just Pine Concepts selling furniture, The Gallery sells Victorian furniture, The Marmion is a friendly drinking establishment, Brewers sell tea and coffee from around the world, Orpeus Records sells many compact disks and tapes, Barbara Tipple sells jewellery, Travelplanners sell holidays, Waitrose is a large food store, Air Circus services include Bauer, Rollerblades, Flexi Foil, Fizz, World Industries and more, Cameron - Davies Opticians, The Dresser sells a range of fashionable clothing, La Petite Creperie sells French food, Southsea Rock sells cards, stationary and more, The Interior Trading Co sells furnishing and accessories, Country Kitchen serves food, Victoriana sells antique furniture and Miles and Miles sells stamps and accessories. Osborne Road is home to more shops in the area including the Queens Hotel, Somargaon Tandoori Restaurant serves Indian Cuisine, Topaz sells cloths for ladies, Nobl Homes is a restaurant, Maison du Harve and de la Pointe de Caux provides help on planning a trip to La Harve, Bunters is a Deli, Little Beginnings sells a variety of cloths, La Croissanterie sells French style food, Baraby's Bistro has a seasonal menu, Dimmers Jewellers of Southsea is a jewellers, Buckwells of Southsea is a butchers, Young George Jewellers buy and sell jewellery, Peter Dyer Gallery sells painting and other gifts, CTS Photographic and Video and Showbiz Restaurant. In Stanley Street there is Steinbecks Wine Bar and Hiscock Gallery.